White Sox staff is going to look a lot different next year. The only guaranteed spots are Danks (assuming he is back and healthy) and Sale. No way they excercise that massive option on Peavy, and Floyd isn’t deserving enough of having his option ($12.5 or 13 MM…right?) picked up. I wouldn’t be surprised to see Quintana start in the minors, to be honest. If I’m Rick Hahn (see how I remembered he’s the new GM next season, and not Kenny), there’s absolutely no way I waste money on Humber. 2013 rotation will be Sale, Danks, Quintana, Liriano, and a FA (McCarthy). Humber can be a longer man(2 M is cheap).Castro and Molina in AAA. All teams need 7 Starters per season. The peavy option won’t be picked up but don’t be surprised to see him still with the team for a longer term cheaper deal 2-3 years at 7-8 per. Quintana is more than likely going to start the season as the 4th starter. Floyd will be moved for some low level prospect. Sale clearly is the ace. 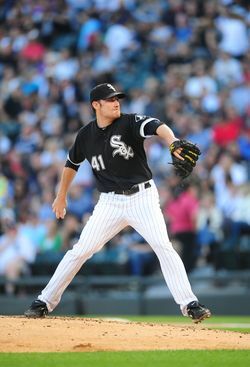 Danks should be back healthy but could be traded this winter for a low level prospect or two or loved at the dead line. But he probably won’t be traded till next winter. Molina should be up in the majors next season. Humber is straight gone same with liriano. High hopes for a guy with a 1.5 WHIP and 4+ ERA in AAA and AA this season. Given that Humber’s qualifying offer is only $2M…the only way that Humber might be non-tendered is if Robin Ventura has lost all faith in him. In what situations was Humber used this month – complete blowouts either way or last man in the bullpen? A qualifying offer will be in the $13-$14MM range and is used once players reach free agency. This has little to do with players still eligible for arbitration. If they tender Humber a contract, then he will go through arbitration to secure his new deal, unless they reach an agreement before.